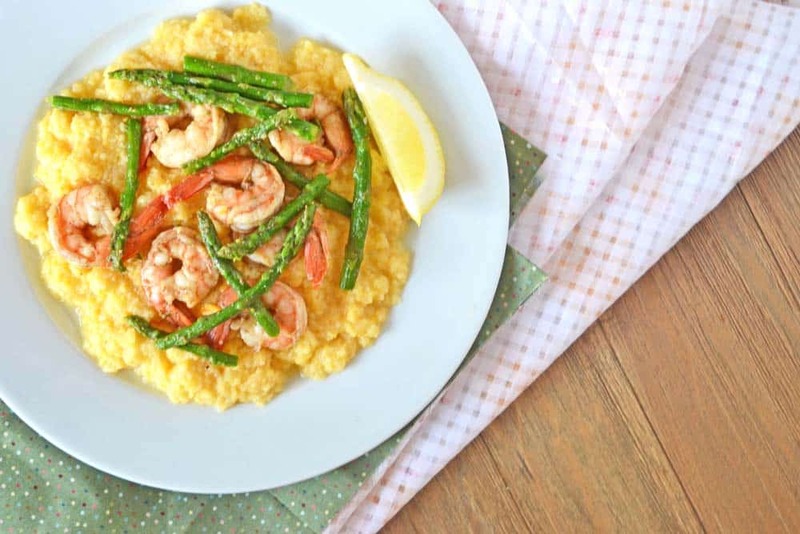 This quick and easy dinner recipe for shrimp and cheddar polenta with asparagus. 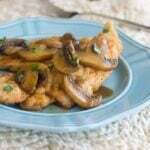 is a snap to make but also is a comfort food reminiscent of shrimp and grits. Some days I don’t want to cook. The house is a mess, the kids are cranky, and well, I’m pretty darned cranky too. On those days, if I manage to resist the lure of 1-800-PIZZA, I need something warm and soft. Something with cheese. Something to make the effort worthwhile. Comfort is in order. But it sure as heck better not take more than 30 minutes to make! This quick and easy dinner can be ready in 20 minutes if I run around like a fool. But usually if I’m making this dinner it means I’m zapped of energy. So count on zero instances of foolish running and 25 minutes until dinner time. O.K., so comfort is in order and make it quick! This dinner is based on the idea of shrimp and grits except I sub in polenta for the grits. Why? Because, not being a true Southerner, polenta is more familiar to me. 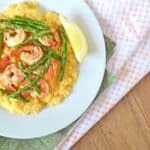 To make this quick and easy dinner a healthy choice for my family, I top the polenta with some quickly sautéed asparagus and some shrimp that have been seasoned with cumin and a pinch of cayenne. Easy, quick, fresh, healthy, tasty and, most important, comforting. 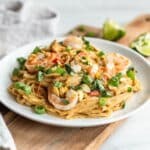 Another comfort food quick and easy dinner with shrimp for you to also check out is this recipe for shrimp scampi pasta bake. Shrimp and cheddar polenta with asparagus is a quick and easy dinner for an otherwise imperfect weeknight. 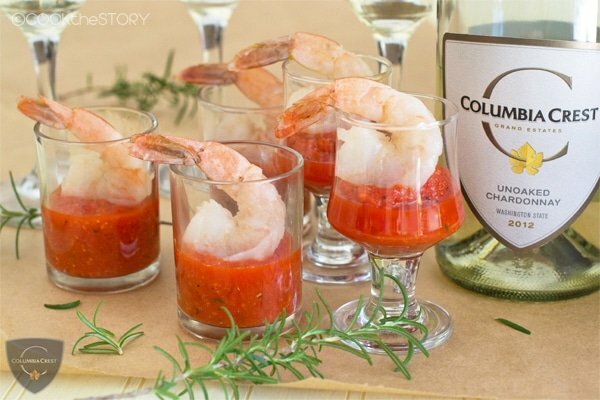 This play on the classic shrimp and grits is as comforting as it is healthy. 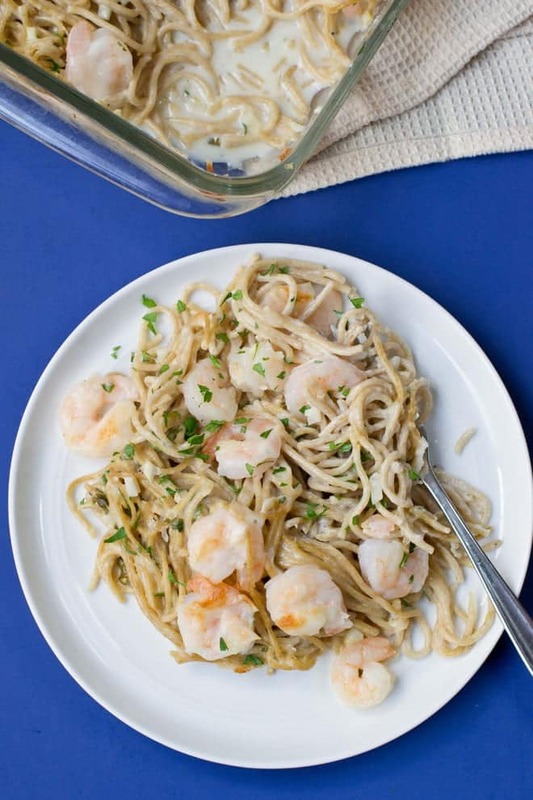 And it's quick to prepare as well, making it the perfect dinner for any weeknight. Pour the broth (or broth and water) into a large saucepan. Add ½ teaspoon of salt. Cover the pot and bring the broth to a boil over high heat. While the liquid is coming to a boil, in a medium bowl combine the cumin and cayenne.Add the shrimp and toss to evenly coat them in the seasoning. Trim the tough ends off of the asparagus and cut them into 2 inch pieces. Grate the cheese. Once the liquid has boiled, remove the pot from the heat. Start whisking as you add the cornmeal in a slow stream (the continuous whisking and slow-streaming prevents clumping). Put the pot over medium heat and stir until it comes to a simmer. Reduce heat to low and stir often for 5 minutes, until the polenta is thickened and has had a chance to cook. Remove from the heat. Add the cheddar and 1 tablespoon of the butter. Stir until it is thoroughly combined. Taste. I find that it usually needs about ¼ teaspoon more salt.Cover the pot and set it aside. Fill a kettle with water and put it on to boil. Warm the remaining tablespoon of butter in a large skillet over medium-high heat. A moment after it has completely melted, add the asparagus and ¼ teaspoon of salt. Stir and cook until the asparagus turns bright green, 1-2 minutes. Add the shrimp. Stir and cook until the shrimp have turned pink all over, 3-5 minutes. 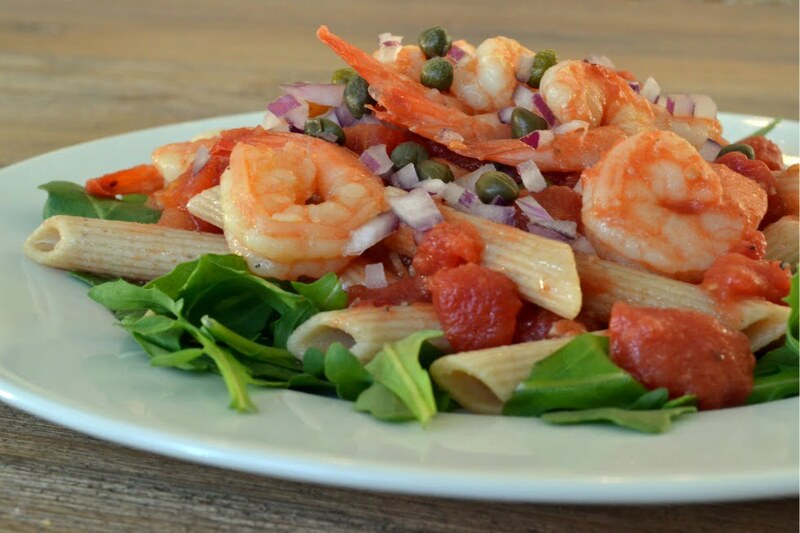 Transfer the shrimp and asparagus to a serving bowl. Give your polenta a stir. If it's gotten really thick or has begun to set add ¼ cup boiling water. Stir. Add a drizzle at a time, stirring after each addition until it back to a soft creamy texture. Scoop polenta onto plates, top with the shrimp and asparagus and give everyone a wedge of lemon to squeeze over their plates. Mmmmm...so good. So comforting. And you'd never know that it was such a quick and easy dinner. 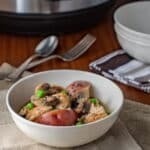 I’m always looking for more quick and easy dinner ideas. 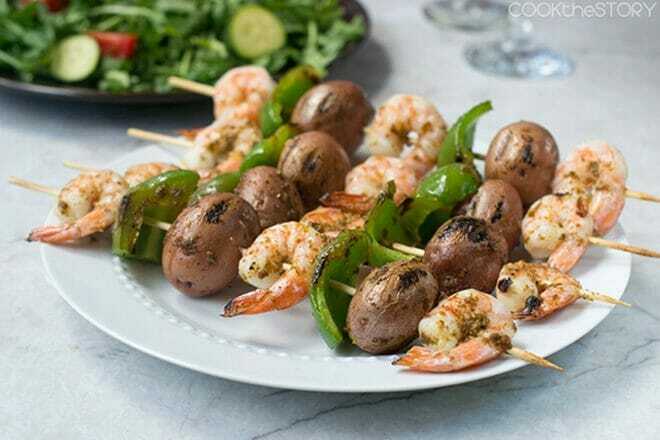 Please scroll on down to the comment section and tell me about your go to easy meal and be sure to check out what others are saying as well. I want you to know that your recipe was not only delicious but helped me immensely. My mom was at the hospital to accompany my Nana all day for biopsies for her cancer. I had to come up with dinner that was comforting and fast and found your site. Thanks so much for the yummy (and easy) food!! Dominique, You’re welcome. Thank you for telling me! Do you know that I love yellow grits/polenta better than white grits? It’s so good…this is definitely comfort food, I agree! 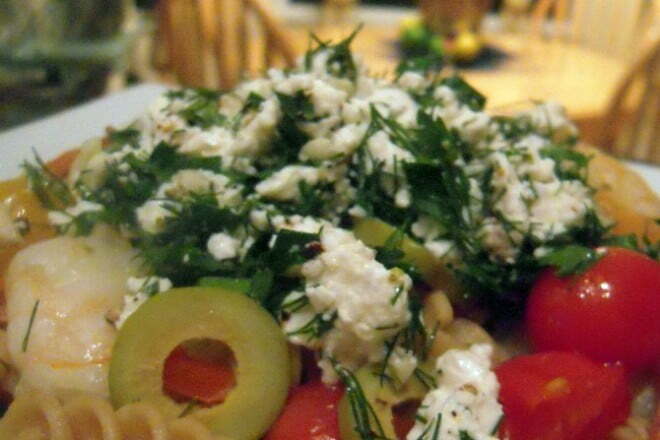 I love your pictures, Christine, and the addition of asparagus! Thank you so much for your comment. A compliment from *you* on my pictures has made my month, honestly. It really means a lot to me. Thank you for the compliment and for commenting. This looks so delicious! They serve a polenta dish at Olivia’s where I work, but now I have a recipe to duplicate it. Awesome! They serve the polenta with pan-seared scallops and steamed asparagus, topped with a sun-dried tomato sauce. And the polenta is made with mascarpone cheese. Delicious! That all sounds *amazing*! I’ve never had mascarpone in polenta before. Guess what I’ll be trying very very soon!!! Christine, this looks and sounds amazing. I’m trying to resist the urge of calling 1-800-PIZZA right now… maybe I’ll make this instead since I have everything on hand!! !